They are uncomfortable and embarrassing, and yet they happen to just about everyone. Skin infections can develop as a minor problem, or they can grow severe and become chronic. There are many different types of skin infections, and each infection develops for its own reasons. The only way to know for sure what type of infection you have is to speak with a dermatologist, who will be able to analyze any rash, wound, or discoloration to determine what the cause behind the infection may be. While many skin infections can heal on their own and will disappear over time, many other infections are contagious, and will spread throughout your body if you do not take steps to heal the core of the problem. There are four primary types of skin infections. The cause of the skin infection will vary based on the type of skin infection developed. 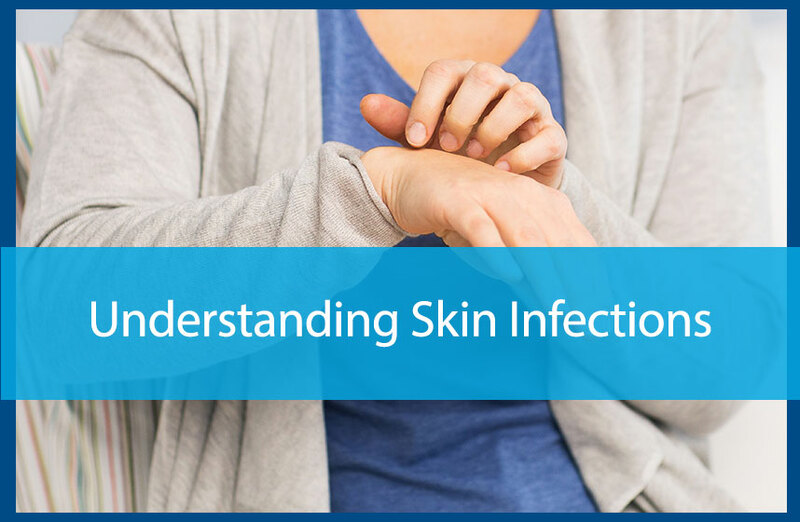 This form of skin infection develops as a result of contact with harmful bacteria. Typically, this type of skin infection will start off very small and will gradually increase as time goes on. Some of the most common bacterial infections include cellulitis, boils, and even leprosy. This form of skin infection is caused by a virus, and is typically contagious. There are some exceptionally common viral infections, like chickenpox and shingles. There are vaccines to help prevent and treat the development of viral skin infections. Warts, measles, and hand, foot and mouth disease are all common forms of viral skin infections. Parasitic infections develop as the result of contact with a parasite. These forms of infections are commonly the result of lice, bedbugs, and scabies, and pose a real threat to your overall health as the infection can move to the bloodstream and affect your overall health. These infections are the result of fungus, and typically develop in areas of the body that are regularly exposed to moisture, such as the armpit. Some of the most common fungus infections include athlete’s foot, ringworm, oral thrush, and diaper rash. What works for one form of skin irritation may not work for another, and in some circumstances, using the treatment that is recommended for one problem could make another problem even worse. Make sure you check with your dermatologist before making any changes to your skincare routine, and seek support in finding the best treatment for overcoming your skin problem. To learn more or to schedule an appointment, contact us at 770-251-5111.